I was coming back to the US after an intense month in India. Culture shock was inevitable bidding “adieu” to the color, noise, and chaos, as well as to the well of spirituality that defines India. The plane headed to the orchestrated calm of Holland, a streamlined, carefully planned environment, well-labeled and user-friendly. After a two-hour layover in Schiphol,Amsterdam’s main international airport, I’d be flying home. Checking email, I discovered that on this very day a memorial service in Jerusalem was paying tribute to a dear friend, my “honorary brother,” Yosef Ben Shlomo HaKohen. Yosef had passed away while I was in India, and I hadn’t made my peace with the loss. Bereft and out of sorts not to be mourning with friends in a synagogue, I wandered aimlessly through the Amsterdam airport. I caught sight of a bright neon sign reading Meditation Centre. Illuminated arrows took me to a carpeted oasis of peace and serenity. The entrance exuded an aura of calm, its milky glass partition embossed with a repeating pattern of a person bowing in prayer. The Centre contains a Quiet Room, a Reading Room, and a Meeting Room where staff can meet with visitors. Panels of stained-glass abstract art that carried no specific religious symbols adorned the Quiet Room, reflecting the beauty of all religions. I spotted fresh flowers and a flickering candle. A middle-aged couple wearing jeans sat silently in the front row, their eyes closed. In a bookcase was a copy of the Zohar, the Jewish book of mysticism on which the Kabbalah is based. I liked finding my scripture next to the Bhagavad-Gita, the Book of Mormon, and beautifully bound and decorated volumes of the Koran in Arabic, English, French, and Spanish. The New Testament was available in 83 languages. Finishing, I turned and saw three Muslims praying nearby in the rear left corner. They must have arrived while I was in prayer. One saw me. We nodded in silent acknowledgement, recognizing that though of different religions, we each needed to connect with the Divine here. On my way out, I met Gerrit Medema, a tall man with dark-rimmed glasses, a new volunteer at the Meditation Centre. 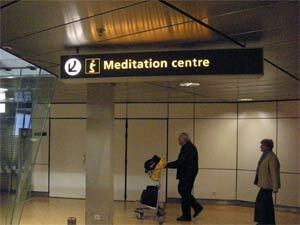 What kind of interfaith role does the Meditation Centre play in this airport, I wondered. Checked my watch – still an hour before my plane would take off. Gerrit was happy to talk, offered me tea and biscuits in the Meeting Room, and invited in two chaplains who serve in the Centre. Why volunteer? “Sometimes people are in transit because they have to face a death in the family,” Gerrit said. “Here they can cry. It is beautiful for me to be able to help them.” Forty million people pass through Schiphol airport every year, they reported, and as chaplains they have “the privilege” of interacting with some 50,000 individuals. This spiritual Centre was first established as a Roman Catholic chapel in 1975 by KLM Airlines, which still maintains an annual budget of 10,000 Euros for chaplain support and upkeep. Over the years, however, reflecting the growth and spread of the interfaith movement everywhere, the chapel became an interfaith spiritual Centre. Chapels started appearing in American airports in the fifties. Chicago’s O’Hare airport recently celebrated 50 years since a Roman Mass was celebrated in a Marshall Field airport restaurant. Christian-oriented chapels established in those early years included airports in Boston, Dallas-Fort Worth, and Sky Harbor in Denver. The nineties brought a significant change, from ecumenical to interreligious. Christian chapels were transformed into interfaith chapels in Toronto, Washington D.C., Florida, Ohio, Indiana, New York, and since have become the norm. In retrospect, it seems inevitable that global travel and the interfaith movement would influence each other. Thanking the Dutch chaplains I found my way out of the Meditation Centre and met two beautiful Muslim women from Nigeria just completing their prayers, Hafsat G. Bayero and Fatima Kano Jibril. I mentioned being Jewish and coming here to say a prayer for a friend of mine who had recently died. My eyes welled up again. Instantaneously both women came forward to hug and comfort me. Hafsat mentioned losing her husband just a few months ago. Moments earlier we had been total strangers. Interfaith chapels offer sanctuary for prayer and more. They provide opportunities for new friendships and understanding among the millions of travelers and border-crossers of the world. No tradition owns them. There for us all, they are places for rest and refreshment from the swirling motion that dictates so much of our lives.